Ran qPCR for the reproducibility aspect of the WSN qPCR Assay Validation. Master mix calcs are here. Plate layout, cycling params, etc. can be found in the Results (see below). Standard curve was the p16RK7 NcoI-linearized curve made on 20120730. Baseline threshold was set to 400 and cycles to analyze was set to 41. Everything looked good except for the Low Feces sample which didn’t produce any amplification. Will identify another sample to use for the Low Feces sample. This entry was posted in Abalone Withering Syndrome qPCR Assay Validation and tagged 09:16-18, 09:16-22, 09:20-11, 494-11-11, 494-11-12, abalone, CFX96, feces, Immomix, p16RK7, qPCR, R3E 7/23/09, R4E 4/17/09, R4E 7/23/09, reproducibility, TAF SD A2, tissue, water filters, withering syndrome, WSN1 on 22 October, 2012 by kubu4. Ran qPCR on the water filter extractions done earlier today. Master mix calcs are here. Plate layout, cyclilng params, etc can be found in the Results (see below). This entry was posted in Abalone Withering Syndrome qPCR Assay Validation and tagged CFX96, Immomix, p16RK7, qPCR, red abalone, water filters, withering syndrome on 19 October, 2012 by kubu4. Ran qPCR on water filter samples isolated on 20120127 in an attempt to find water samples that have a higher copy number than Nate’s existing samples for use in the withering syndrome qPCR assay validation. Plate layout, cycling params, etc can be found in the qPCR Report (see Results). Everything looked good. Will use sample TAF SD A2 as the high copy number water sample for the withering syndrome qPCR assay. 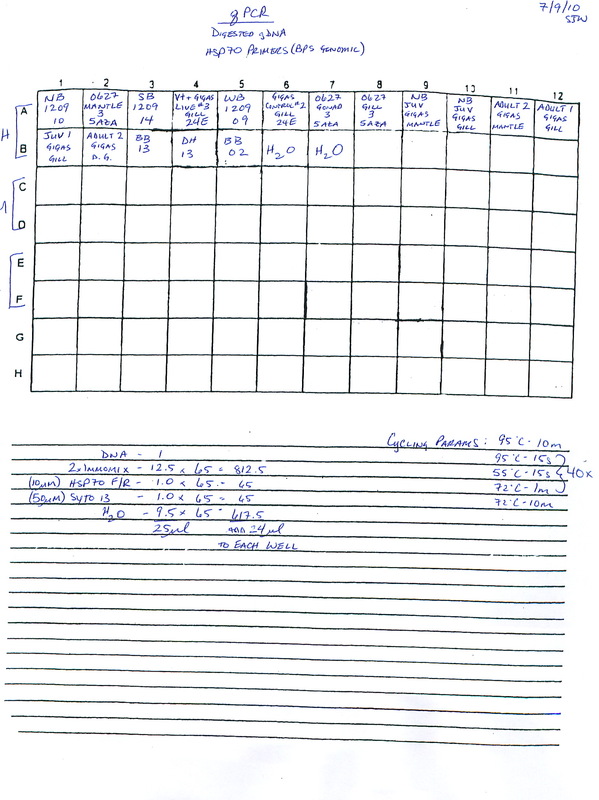 This entry was posted in 2010 Samples, Abalone Withering Syndrome qPCR Assay Validation and tagged CFX96, Immomix, p16RK7, qPCR, TAF 0M A, TAF 0M B, TAF ND A1, TAF SD A1, TAF SD A2, water filters, withering syndrome, WSN1 on 17 October, 2012 by kubu4. Performed qPCR with WSN1 primer/probe set on the test water filter extractions from 20120126. Master mix calcs are here. Plate layout, cycling params, etc can be found in the qPCR Report (see Results). Standards used were Nate’s old standards (no date on tubes/box), as provided by Lisa. The standards are simply labeled as 2x, 3x, 4x, etc. down to 8x. All reactions were run in duplicate. The samples analyzed in this qPCR were from The Abalone Farm (TAF), The Cultured Abalone (TCA), and American Abalone (AmA) all at 0 meters (0M), outfall, or drain. All samples analyzed produced a signal except the American Abalone 0M samples. The Abalone Farm South Drain (SD) samples came up the earliest at ~30 Cq, which corresponds to ~the 5x standard. These results confirm that the assay is viable for detection of Withering Syndrome from water filter DNA extractions. Will proceed with extracting and qPCR the remaining filters. Additionally, the standard curve is almost spot on the same as the last time it was run (see 20111221). UPDATED 20121024 – Modified data file (and subsequently the qPCR Report) to have a baseline threshold of 400 and cycles to analyze 41 to match existing conditions used for the withering syndrome qPCR assay validation. UPDATE 20140204 – Updated the Ab Endo spreadsheet when Lisa was doing some data analysis and realized that the data she had was much different than what was expected, based on the copy numbers I had entered into the spreadsheet. Turns out, after I updated the baseline threshold on 20121024, I had neglected to update the data in the Ab Endo spreadsheet. That data has now been entered. 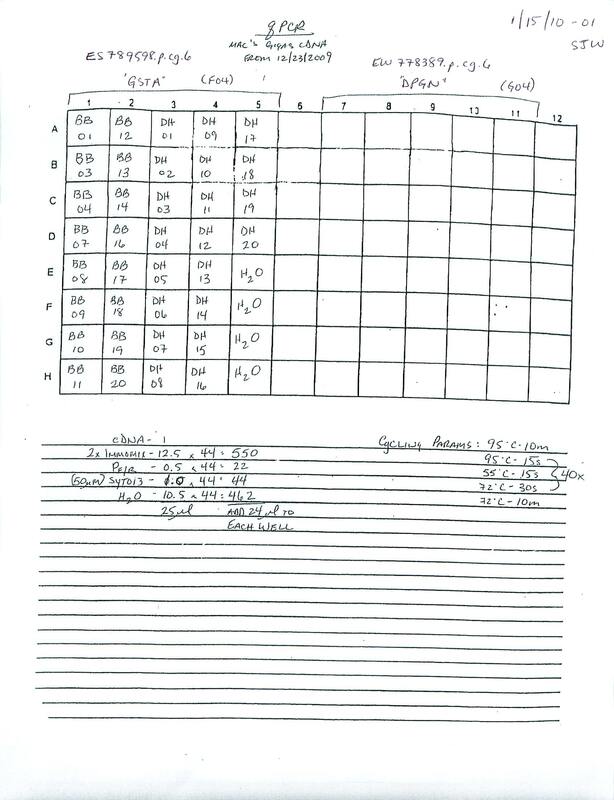 This entry was posted in 2010 Samples, Ab Endo and tagged AmA 0M A1, AmA 0M A2, AmA 0M B1, AmA 0M B2, AmA Drain A1, AmA Drain A2, AmA Drain B1, AmA Drain B2, CFX96, Immomix, qPCR, TAF 0M A, TAF 0M B, TAF ND A1, TAF SD A1, TAF SD A2, TCA 0M A1, TCA 0M A2, TCA 0M B1, TCA 0M B2, TCA out East A, TCA out East B, TCA out West A, TCA out West B, water filters, WSN1 on 27 January, 2012 by kubu4. Ran qPCR with WSN1 primer/probe set on filter extracts from 20111123 to get a rough idea of how well the extractions worked. Master mix calcs are here. Plate layout, cycling params, etc. can be found in the qPCR Report (see Results). Standards used were Nate’s old standards (no date on tubes/box), as provided by Lisa. The standards are simply labeled as 2x, 3x, 4x, etc. down to 8x. All reactions were run in duplicate. None of the filter extractions produced amplification before cycle 40. And, of those that did, only one of each replicate produced a signal. Will have to discuss data with Lisa to see which samples were expected to be “hot” for withering syndrome, if any. Have decided that the extraction method may be limiting, due to how tight the filter “fits” into the 1.5mL tubes. It seems like the Proteinase K digestion step may not be able to fully coat the filter due to the tight fit. This is problematic, since we are trying to actually quantify the number of WS bugs on each filters. Will test out various filter modifications using test filters from the basement to find a method that makes me feel more comfortable with the potential success of the extraction efficiency. This entry was posted in 2010 Samples, Ab Endo, Miscellaneous and tagged CFX96, Immomix, MA +500 A, MA +500 B, MA -100 B1, PSN +100M A, PSN +100M B, PSN +500 A1, PSN +500 B1, PSN -100 A, PSN -100 B, PSN 0M A, PSN 0M B, qPCR, RM A, RM B, water filters, WSN1 on 30 November, 2011 by kubu4. Ran a full plate for testing well-to-well consistency (or, inconsistency!) of the Opticon 2, since it’s been behaving poorly lately. This will provide us with an idea of whether or not the oddities that we’ve been witnessing have any effect on our actual data. Used C.gigas gDNA (DH15 from 20100519; 0.5128ug/uL) and IL17 Internal Fw/Rv primers (SR ID: 255, 256), which have previously produced an amplicon with gDNA. Master mix calcs/plate layout/cycling parameters/etc are here. DNA was combined in master mix so that all wells received ~100ng of gDNA. This entry was posted in Miscellaneous and tagged Crassostrea gigas, DH15, gDNA, IL-17, Immomix, Opticon2, Pacific oyster, qPCR, SR ID: 255, SR ID: 256, SYTO 13, troubleshooting on 12 October, 2010 by kubu4. 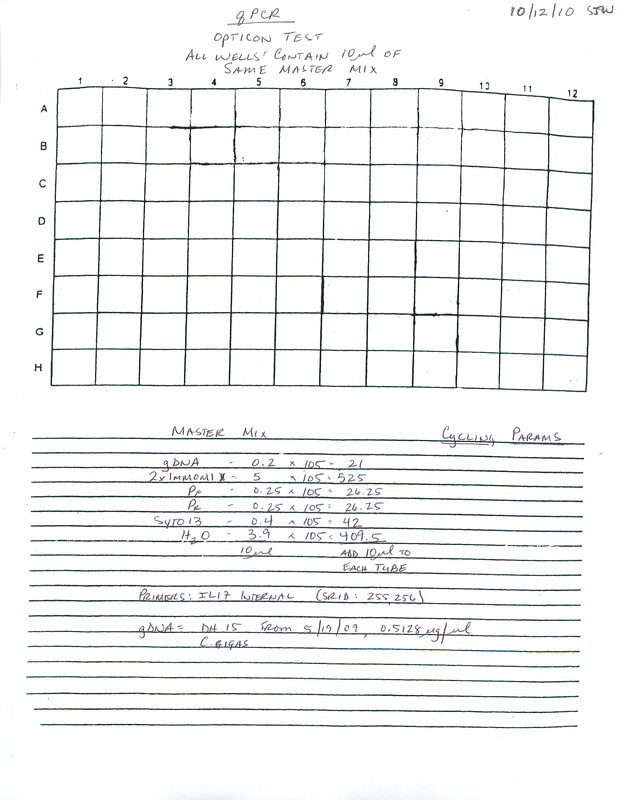 qPCR plate layout/setup is here. This entry was posted in Miscellaneous and tagged 5-azacitidine, Crassostrea gigas, gill, HSP 70, Immomix, mantle, Opticon2, Pacific oyster, qPCR, SYTO 13, Vibrio exposure, Vibrio tubiashii on 9 July, 2010 by kubu4. Utilized to sets of primers obtained from the Friedman Lab: VptA (referred to as “Hasegawa”, even though the reference article calls the primers Vtp A) and Vt IGS (referred to as “Lee” primers, presumably from a published article). For template, used “RE22 DNA” that was given to me by Elene. Tube is dated 9/10/09 and has no indication of concentration. Performed qPCR on a set of 10-fold dilutions. 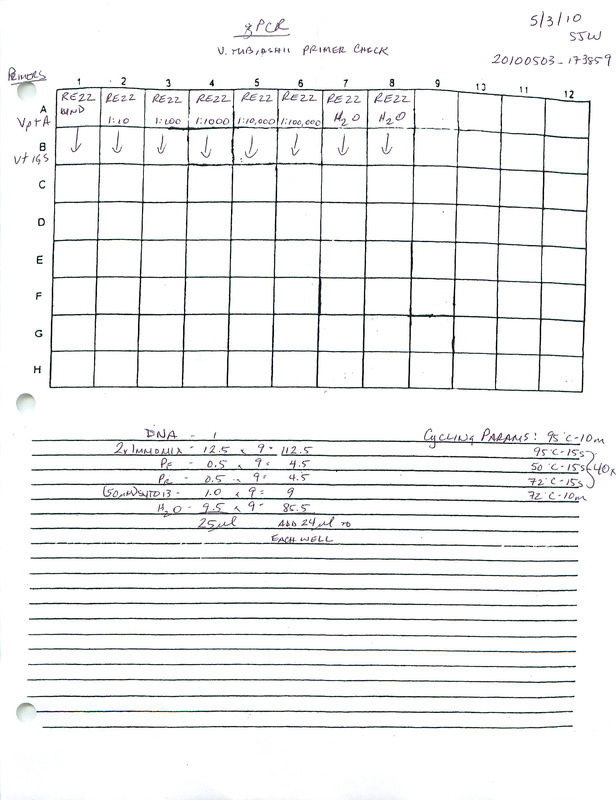 Plate layout/qPCR set up is here, along with dilution series used. The VptA primer set generated a nice looking set of dilutions with appropriate spacing (~3.2 Ct/10-fold dilution). HOWEVER, the raw fluorescence signal is very low (only 0.4 units; good signal is usually 3-5-fold higher) AND the melting curve doesn’t look that great. The melting curve could look poor due to the low signal, since it doesn’t come up much higher than background levels. It should be noted that the low fluorescence levels generated could simply be due to the amplicon size generated by these primers. The amplicon size is only 63bp. An amplicon of this size might not be able to incorporate significant amounts of dye to generate a “normal” level of fluorescence (1.25 – 2 units). The Vt IGS primers failed to generate any product. This entry was posted in Miscellaneous and tagged Immomix, qPCR, RE22, SYTO 13, Vibrio tubiashii, VptA, Vt IGS on 3 May, 2010 by kubu4. GSTA and DPGN primer sets used. 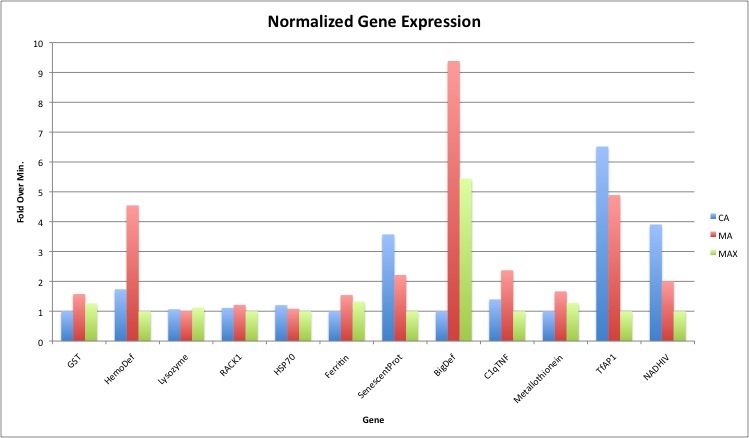 These are duplicates based on initial differences seen between BB and DH expression. qPCR set up and plate layout here. This entry was posted in PROPS and tagged BB, cDNA, DH, DPGN, GSTA, Immomix, Opticon2, qPCR, SYTO 13 on 15 January, 2010 by kubu4.